​Solid Edge Flow Simulation is an embedded CFD simulation tool for easy, fast and accurate fluid flow and heat transfer analysis inside Solid Edge. Solid Edge Flow Simulation is the only frontloading computational fluid dynamics (CFD) analysis tool that is fully embedded in Solid Edge. Frontloading CFD refers to the practice of moving CFD simulation early into the design process where it can help design engineers examine trends and eliminate less desirable design options. Fully integrated preprocessor, solver and post-processor: With FloEFD you need only one fully integrated package to analyze your designs. 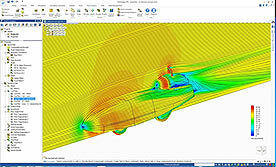 Featuring automated meshing and robust convergence criteria, FloEFD speeds up the overall design process. Integrated parametric study and design comparison functionality: Understand influence of changes in the geometry or boundary conditions on the results by comparing a wide range of project variants. Assess results by numerical values, graphs or animations. Experience the power of instinctive user experience: an easy-to-use GUI offers considerable intelligent automation so it’s easy to use for the design engineer and powerful enough for the analysis specialist.